From Latin conglomerātus, past participle of conglomerāre (“to pile into a heap, to roll together”), from con- (“prefix indicating a being または bringing together of several objects”) (ultimately from Proto-Indo-European *ḱóm (“beside, by, near, with”)) + glomerāre (from glomerō (“to pile into a heap, to make into a ball, glomerate”), from glomus (“ball of thread; ball-shaped mass”), from Proto-Indo-European *gel- (“to form into a ball; ball”)). A cluster of heterogeneous things. They [miracles in the canonical gospels] are held, too, together by his [Jesus Christ's] strong and central personality, which does not leave them a conglomerate of marvellous anecdotes accidentally heaped together, but parts of a great organic whole, of which every part is in vital coherence with every other. (business) A corporation formed by the combination of several smaller corporations whose activities are unrelated to the corporation's primary activity. The 2017 list includes 80 financial conglomerates with the head of group located in the European Union or European Economic Area, one financial conglomerate with the head of group in Switzerland, one in Bermuda, and two in the United States. (geology) A rock consisting of gravel or pebbles embedded in a matrix. When sandstone is coarse-grained, it is usually called grit. If the grains are rounded, and large enough to be called pebbles, it becomes a conglomerate, or pudding-stone, which may consist of pieces of one or of many different kinds of rock. 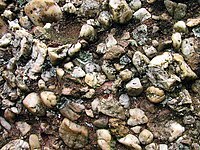 A conglomerate, therefore, is simply gravel bound together by a cement. Calcareous lias, slate, and trap are still to be found there, rising from layers of conglomerate like teeth out of a gum. But the pickaxe has broken up and levelled those bristling, rugged peaks which were once the homes of the eagles. Everywhere in the river appeared a very remarkable conglomerate, and like the slate in exhibiting all the stages of formation. The matrix was the blue clay of the bank, the rubble was the gravel of the bottom. The Middle Voltaian lies unconformably on the Lower Voltaian with a basal conglomerate that can be correlated with conglomerates of the Buem Formation. Both sets of conglomerates have been interpreted as tillites, possibly equivalent to the Infracambrian tillites of the Rokelide–Mauritanide belt west of the craton […] and in the Taoudeni Basin […]. Clustered together into a mass. By the motion of the Heart, through the Emulgent Branches, the Blood is brought to the Kidneys, and is there freed of its Serum by their little Glands, […] Much after the ſame manner, are their proper Fluids ſeparated from the Blood in the Liver, Sweetbread, Teſticles, and the other Conglobat and Conglomerate Glands of the Body […]. (geology) Composed of fragments of rock, pebbles, or stones cemented together. The Santa Margarita Formation in the southern Temblor Range, composed of conglomerate and subordinate sandstone, evolved as a large complex of fan deltas and submarine fans in late Miocene time. He also documented some intercalated mottled reddish clays and marls, and the upper horizons containing bluish clays with conglomerate beds. (transitive) To combine together into a larger mass. [V]apors are never attracted or drawn up above the middle Region of the Air; for that the cold Air there, by thickning and conglomerating them, preſently turn them into clouds: and thence proceeds Miſts, Rains, Snows, Hayls, &c.
"In less than an hour," he said, looking up to the sun's disc, which was then feebly struggling through a dim mass of conglomerating clouds; "in less than an hour you shall be fully satisfied and amply revenged." The tin cylinder, filled with iron balls, which is fired from our smooth-bored guns, was unsuitable for a rifled gun, because the breaking up of such a projectile in the bore was likely to injure the rifling. Then again, lead balls could not well be substituted for iron ones on account of their liability to conglomerate or adhere together in lumps. Looked at from this angle, we soon realize that the perceived greatness of [William] Shakespeare lies less in his 'originality', than in his exceptional ability to conglomerate and re-apply materials and models in the creation of new dramatic works. 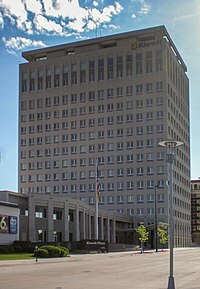 (transitive, business) To combine together into a larger corporation. Some firms conglomerated with suppliers of intermediate inputs and the railroad to carry their products. The hallmark of the late twentieth century in the media industries (かつ adjacent/overlapping territories, such as the Internet) was the weakening of boundaries that previously distinguished arenas, enterprises, institutions, and professions. […] Entertainment media—the rapidly conglomerating TV/film/cable/publishing/music/sports/Internet megasauruses that can be seen grazing in Los Angeles and New York—represent the pattern even more dramatically than in the case of journalism. ^ James A. H. Murray [et al. ], editor (1884–1928), “Conglomerate, v.”, in A New English Dictionary on Historical Principles (Oxford English Dictionary), volume II (C), London: Clarendon Press, OCLC 15566697, page 822, column 1.